Alright, many people have told me about "them." "They" came to my apartment the first day I started unpacking and moving in. But no one told me that "they" would be my worst enemy in Korea. I mean really now, "they" woke me up this morning on my one lousy day off work! 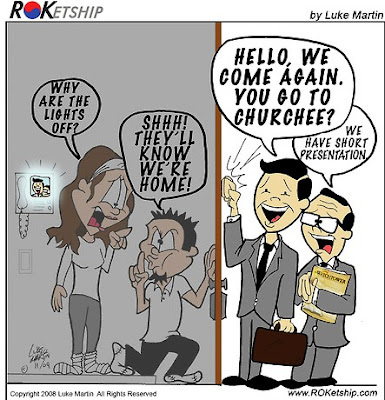 Yes people, I'm talking about Jehovah's Witnesses here in Korea. There is nothing wrong with being a Jehova's Witness. Although it is a little peculiar that in 2004 more than 10,000 of them had to serve prison terms in South Korea for disregarding the compulsory military service. Don't get me wrong, religion is an amazing thing that only makes the world a better place. As a somewhat practicing Catholic, I find myself taking the more spiritual approach than a devout Church goer. Growing up I learned to appreciate the joy of having a religion in your life. However, the one thing that always bothered me was those who try to impose their religion on others. Each time someone knocks on my door I immediately get very quiet and turn on my door camera, in fear that its the Jehova's. Usually I have two younger women who knock on my door, and they strike up a pleasantly normal conversation with you. They want to know your name, how long you have lived in Korea, and just start talking to you like their your best friend. Then they try to give you a million hand outs like the one pictured. By the time you get rid of them you will have spend around fifteen minutes trying everything humanly possible to send them on their way. So why not just answer my door and casually tell them "I'm not interested?" Well this has been tried too, however they will just keep knocking on your door and ringing your doorbell until you open it again. And trust me, they will come back again tomorrow, and the next day to see if they can talk to you. Therefore, until there is another grand solution to get rid of the Jehova's witnesses, my reccomendation is to never answer your door when someone knocks, and pretend like your not home. Or maybe you could just put a giant sign on your door that says "I HATE GOD" instead! so i just read your jehovas witness mayhem and my advice is... when i was in idaho and mormons were everywhere (knocking on doors, on campus, and not just missionaries - a lot of them were just strong mormons preaching), i would say "your religion is fake, and god will send you to hell"... then walk as fast as i could in the opposite direction. hope it helps! The handout you post here is not from Jehovas Witness. I will give you an unrequested advise: Next time ask "are you JW?". Try to hear what they have to say to you. They are talking about God's Kingdom and the blesses for the mankind. At least you will know, what they are talking about. If you say "I'm not interested?" They will ask you "what are you not interest in". Explain your reasons. They will not visit you again the next day or week. If you hate their visitis so much then you should say "PLEASE WRITE DOWN MY NAME AND ADRESS AND MAKE SURE NO ONE FROM JW WILL VISIT ME IN THE FUTURE". They will leave you alone for years and years. At least you know what they are talking about and you will not have any reasons to complain like "I didn't know about it".